I love using jars for beautiful but practical storage systems in our home. I use them for everything…from keeping odds and ends from room to room organized, to storing clothespins together, to housing a rainbow of crayons in our craft basket, to arranging and displaying the contents in our medicine cabinet just *so*. Your basic, clear jar is a simple but charming way to store the smaller items in your home. 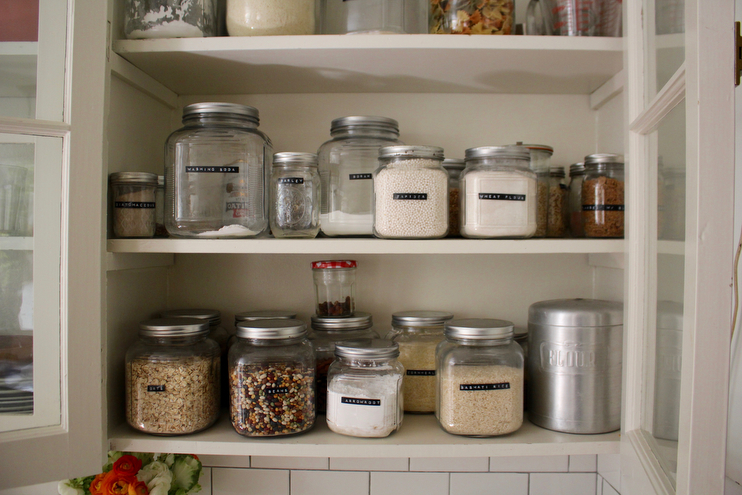 One of my favorite methods of glass jar storage is how we use them in our kitchen pantry. They just happen to be the perfect thing for storing your dry goods. I decided when unpacking our kitchen boxes to utilize our original Shaker style cabinets for dry pantry goods, like rice and beans and dry ingredients for baking, right alongside our everyday items like plates, bowls, and cups. I did the same at our old place on the open shelving we installed because there was literally little to no storage in our tiny shotgun kitchen. I know some of you out there are familiar with this style. In our current home, the beautiful but transparent glass doors on our cabinets mean you can’t really shove things in there willy nilly and get away with it. Or I suppose you could, but the organizer in me isn’t going to have that. I even organize the inside of my cupboards that aren’t see-though, because I really enjoy the process of organizing and it makes it easier do find this or that. I think pretty organization is key if it’s going to be visible. My mom had passed down a few of these jars from her vintage collection years ago but I found the rest at Walmart for a really good price. They’re not vintage but they are pretty much identical to the select old ones I have. I love that they come in three sizes, giving me more storage for sugar and flour. You can find them here. And then there’s the whole knowing what’s inside said glass jars, because you think you’ll be able to remember that this particular shade of white is indeed arrow root powder, but you won’t. Trust me. No one wants to be in a frenzy sticking their noses (or fingers) in various containers to see if this or that is flour or sugar or soda or wheat when in the middle of a recipe. You gotta label them! Again, to no surprise, I use my DYMO embossing label maker for this. I am warning you, once you get one of these labelers you will get a little slap happy and start going nuts for fun. I think it’s a thing the Monica Geller’s of the world can only fully appreciate. With that, have fun making your kitchen pantry all purdy guys! I’m also wondering if that type of label comes off easily. I’ve tried writing on the lids, or stickers… but it’s a pain to switch up. Our kitchens are very similar. Mine have the glass doors as well but the bottom cabinets are an espresso and the hardware is more modern. People always ask me if it is hard to keep my shelves organized and I tell them that they would be this organized whether or not I had glass =) I think it is really fun to display things. I love your big jars and they are lovely. I have flour and sugar displayed on the open too. I have hand painted tea cups displayed higher and every day use on the bottom. 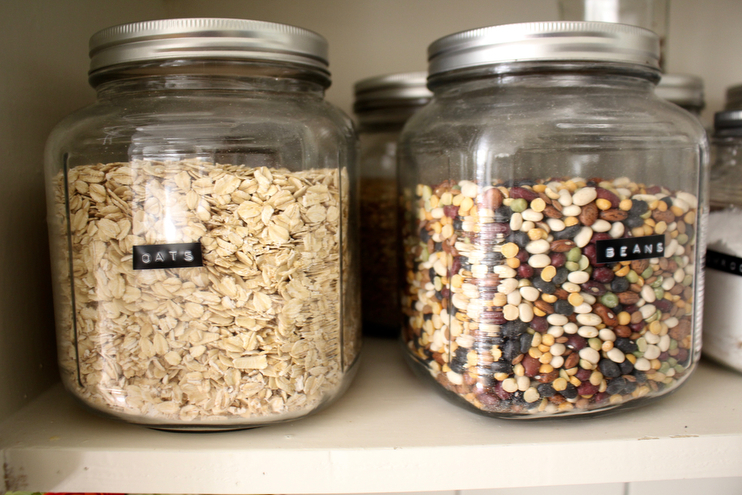 I also love storing my pantry items in jars so they look pretty, but my question is what do you do with the half-full larger bags, boxes, and containers after you’ve poured them into your glass containers? Those are definitely not pretty and I never know what to do with them. Thank you! 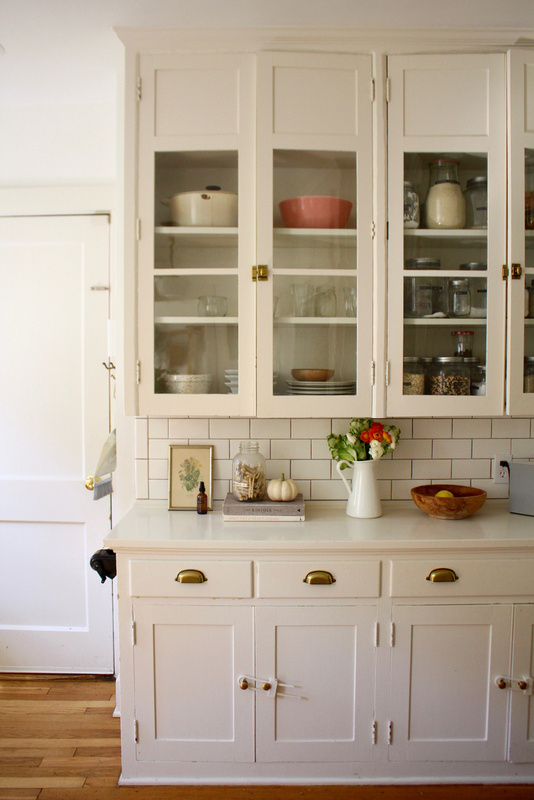 Your kitchen pantry is what I wished mine looked like!